It's time to make a break from your concrete jungle; nature is calling louder than ever, escape to the country to a self-catering cottage holiday set in splendid rural surroundings. The countryside is nearer than you ever believed and just waiting to share its many treasures with you. Believe me it's more than a few cows and bulls in a field, or even a meadow packed with sheep. There's masses more and a good way to discover the goodies on offer is by visiting one of Britain's fifteen wonderful, awe-inspiring national parks and numerous Areas of Outstanding Natural Beauty. Most of the Isle of Wight rural areas are classed as AONB and the nearest national park is across the Solent; the New Forest. The Isle of Wight countryside is delicious; pretty, lovely views and peaceful. Parts of the island around towns are developed and yet there are so many completely unspoiled areas where few people live and the landscapes belong to nature. Much of west Wight is little developed and mainly farmland or woodland. There are numerous small lanes where it is easy to get lost, roads the width of a car where one hopes and prays not to meet another car travelling in the opposite direction. This is the ideal birdwatchers habitat - a little piece of paradise in the south of England. Read more about cottages in the country if you generally appreciate the British countryside and spending your leisure time there. 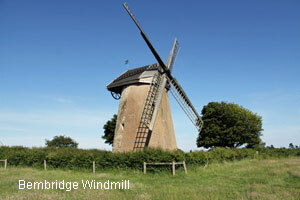 A nature ramble on the Isle of Wight can be a pleasant and relaxing walk or an adventure. If you have young children, turn it into an adventure with mysterious objects and surprising scenes at every turn. There are plenty of discoveries to stand and be bemused by, wild flowers that are rare in other parts of Britain. 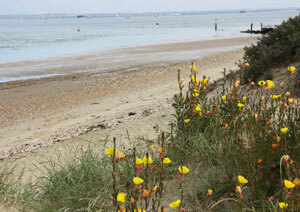 Go to Bembridge Beach to see Evening primrose flowering in their thousands. Take the opportunity to talk about the medicinal qualities of evening primrose and other plants. Herbs growing by the roadside can be another talking point and their culinary and health giving values. There are plenty of wild plants that can be included in our diet for flavour and nutrition. Dill and dandelions are two common examples. This could lead on to poisonous plants such as deadly nightshade (used in heart medications) that you may see twining through a hedge or poisonous toadstools such as the 'death cap fungus' that grows on the island. Red spotted fly agaric is often found under trees and hedgerows. This familiar toadstool is most attractive and children should be warned not to touch it. It can be deadly if eaten and cause hallucinations in small quantities when smoked. A gentle ramble through tranquil countryside can become quite an adventure and discovery for people of any age. Enjoy the views en-route. 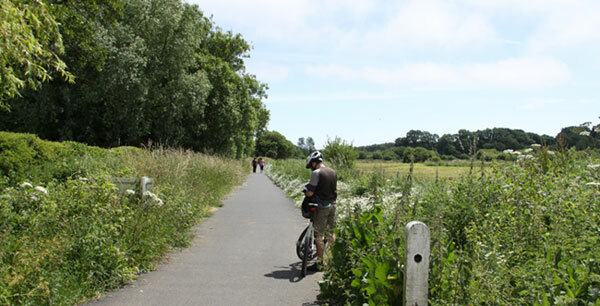 There are plenty of narrow lanes criss crossing the Isle of Wight that are superb for traffic-free cycling and country walks. Sweeping views across the countryside are magnificent. Bring a camera to capture the beauty to enjoy a long time later for your pleasure. 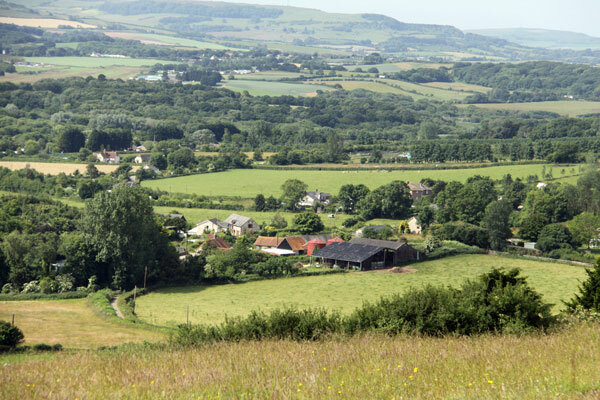 Views of farmland towards Sandown, East Wight coast. Do you love the Isle of Wight countryside and have favourite tales to tell of adventures in the country? Do write and let us know. We are happy to publish your information about any wonderful aspects of the island. Did you take an amazing photograph of a good view in the Isle of Wight and are willing to share it with us? Your name would be included.